Do you ever find yourself with a surplus of a specific food? And then trying so many different ways to use it cause you don’t want it to go to waste? Recently, I have somehow managed to keep acquiring zucchini. I don’t really mind cause zucchini is so versatile and there are many different things you can make with it. Sometimes, I will throw it in tomato sauce for my pasta to add some extra flavor and texture. Other times a simple saute in olive oil with some salt and pepper does the trick. It is also great in eggs, or shredded and thrown into pancakes. Mixing shredded zucchini into pancake batter is actually one of my 2 year olds favorite cooking tasks. And it is a great way to get her to eat some extra veggies too! 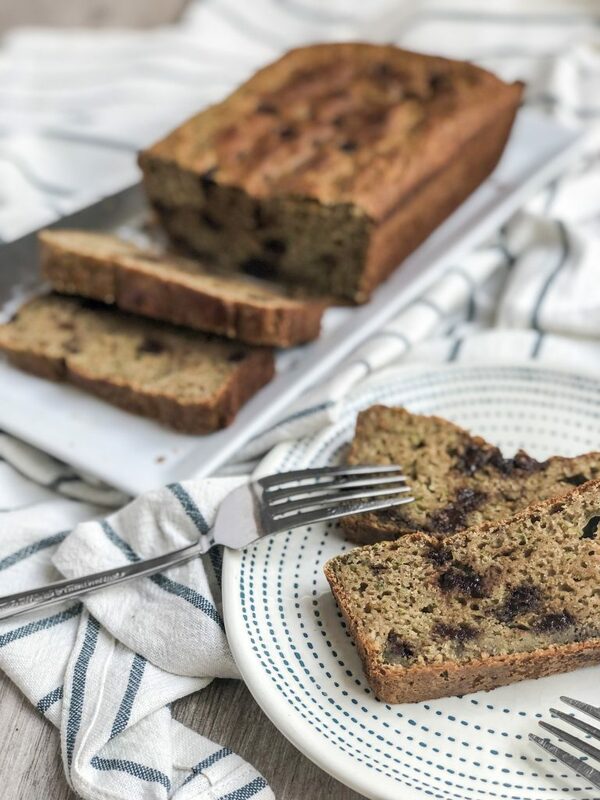 Making gluten free zucchini bread is another great way to use up zucchini. And you can totally make more than one at the same time (if you have multiple pans) and freeze for later. 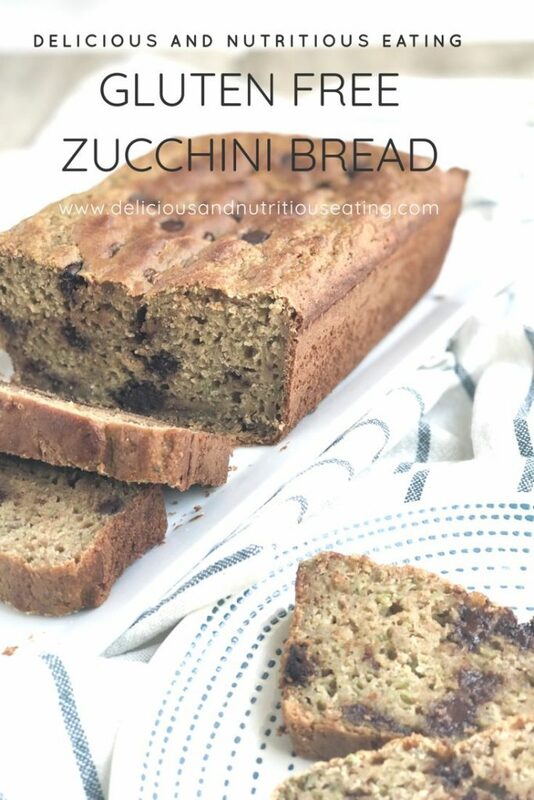 When looking for a good recipe online, to use my surplus of zucchinis, I noticed a lot of zucchini bread recipes used a ton of sugar. While I like my gluten free zucchini bread to be a little sweet, I don’t want it to be a super sweet dessert. So I ended up taking my Gluten Free Banana Bread recipe and changed it up to make my gluten free zucchini bread. The first try wasn’t what I wanted (too sweet and over baked) but the second try hit the spot. Preheat oven to 350 degrees. Spray 9×5 inch loaf pan with cooking spray and set aside. Add flour, sugar, spices, salt, and baking soda to a large mixing bowl. Stir until uniform. Add wet ingredients (zucchini, applesauce, yogurt, egg, and vanilla extract) and mix together. Fold in 1/3 cup of chocolate chips. Pour batter into loaf pan and sprinkle some extra chocolate chips over the top if desired. Bake in oven for 45-50 minutes or until an inserted toothpick comes out clean. Allow to cool slightly before slicing and serving. 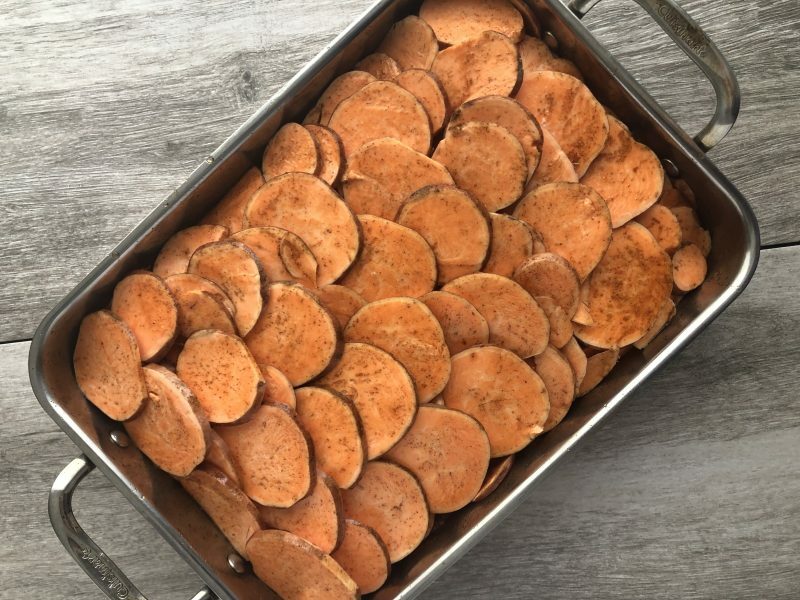 Sweet potatoes are an essential part of any Thanksgiving feast. 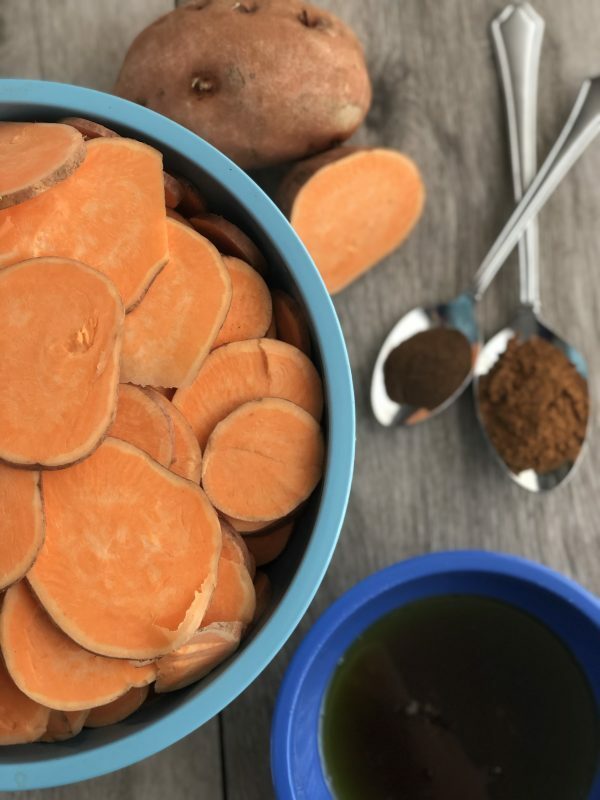 They are hearty, sweet, full of important nutrients and you can do a lot of different things with them. For Thanksgiving though, I prefer to either just roast them or do some sort of sweet potato casserole. Nothing too complicated, as I don’t want to cover them up with 1,000 different ingredients or spend hours in the kitchen on 1 side dish. Plus, I’d much rather also have time to make dessert. Any one else with me? 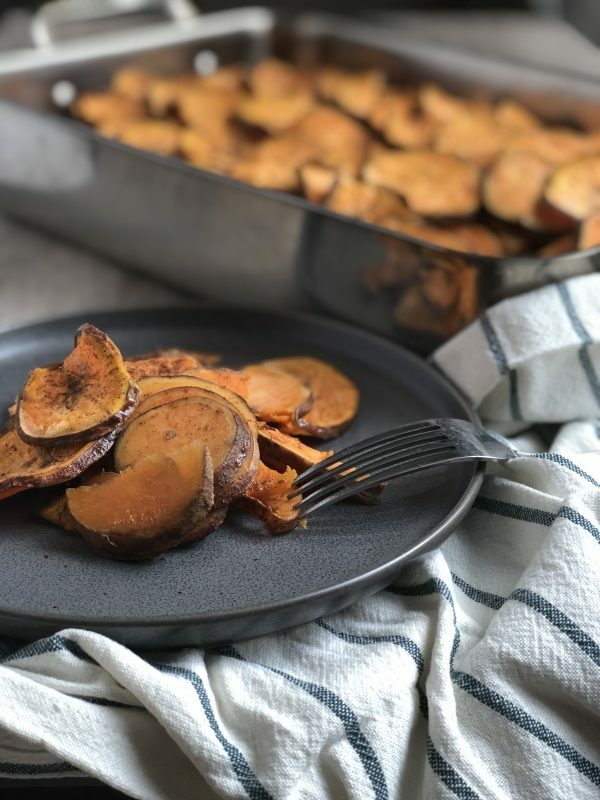 So today, I want to share with you a simple, but elegant and tasty, scalloped sweet potato casserole recipe with only 5 ingredients. 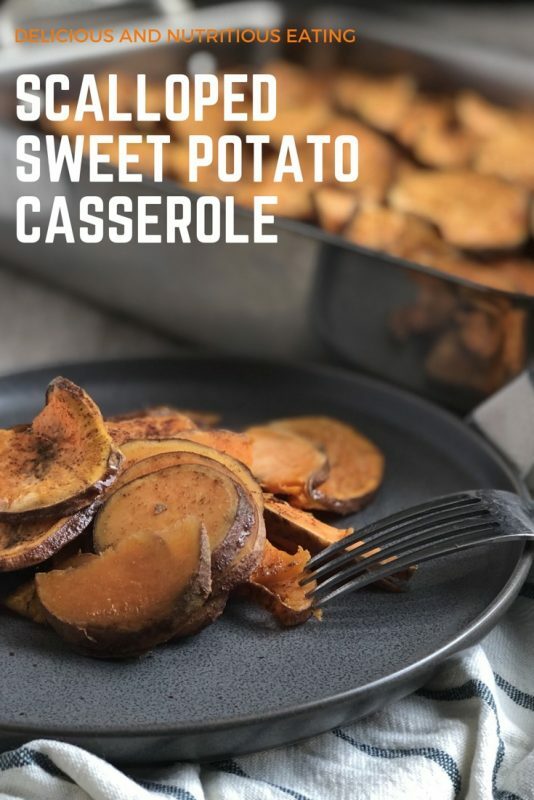 I actually first made this scalloped sweet potato casserole last year when I wanted to make sure my almost 11 month old daughter had something that I knew she would and could eat at a Friendsgiving we went to. I love honey but since she wasn’t yet a year old we went with just a touch of maple syrup to lightly sweeten this casserole. In my pictures you can see I left the skin on the sweet potatoes but when I first made it for Friendsgiving I peeled it off because … babies. Anyways, this scalloped sweet potato casserole is pretty easy and foolproof. Slicing the sweet potatoes took the longest amount of time and effort but once that was done it only took a few minutes to put together. Next, I mixed the remained ingredients in a small mixing bowl. Then, I sprayed a roasting pan with cooking spray and started laying down the sweet potato circles like shingles. Then I brushed the sweet potatoes with the oil, syrup, and spices mixture. Added another sweet potato layer and brushed with the liquid mixture. And then another layer and brushed until all the sweet potatoes were used. After brushing the top layer I drizzled whatever oil/syrup was left over the casserole. Finally, I baked in the oven for about 45 minutes at 400 degrees. Just be aware that the top layer will be a little crispier and the bottom layer will be softer. 2. Rinse off and scrub sweet potatoes well. Peel if desired but not necessary. 3. 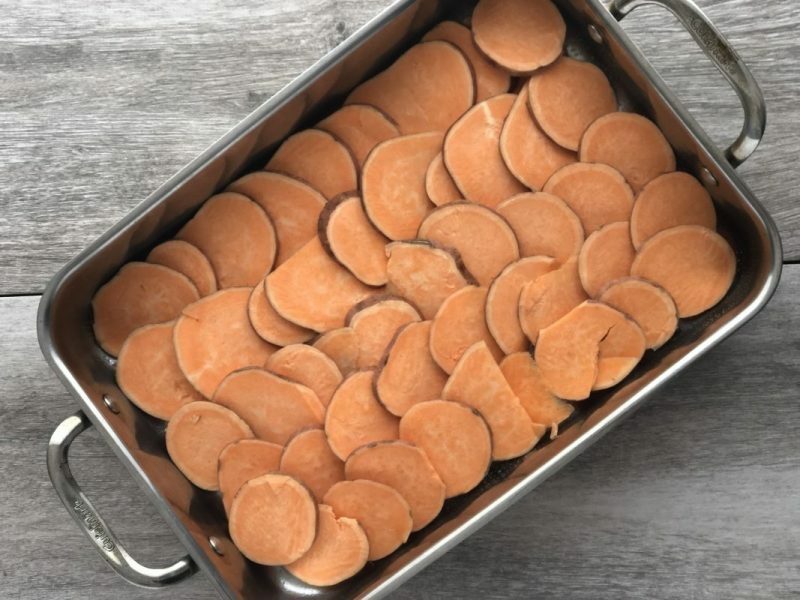 Slice sweet potatoes into 1/4 inch circles with a mandolin. 4. Mix remaining ingredients together in a small mixing bowl. 5. Spray a deep roasting pan with cooking spray and start lining the bottom with potato circles, overlapping like shingles. 6. After you put down the first sweet potato layer use a brush to brush oil and syrup mixture. 7. Continue adding layers and brushing. If you have extra oil mixture at the end just drizzle it over the top after brushing. 8. 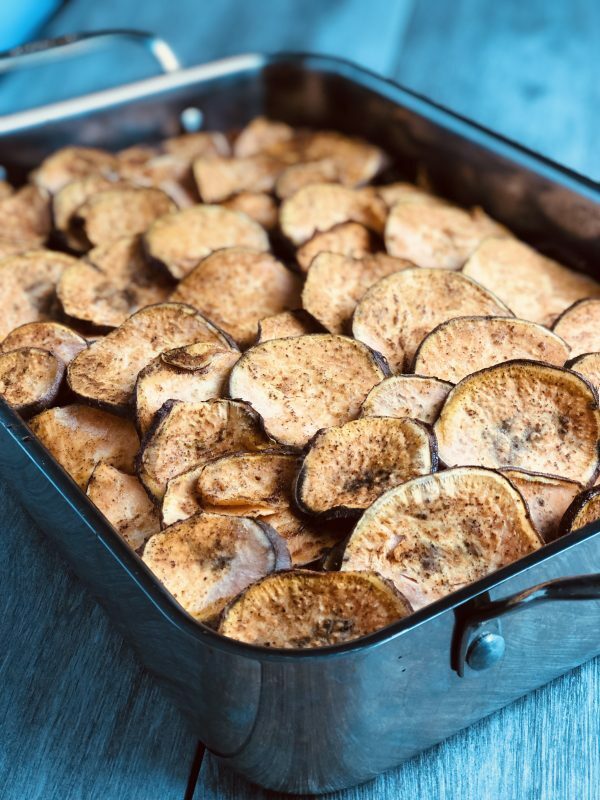 Cook in oven for 45-60 minutes or until potatoes reach desired softness – keep in mind the potatoes on the bottom will get softer than those on the top. 9. Allow to cool slightly and enjoy! The season of fall is upon us, even though it is still pretty hot here in South Florida. However, I did notice I haven’t been getting sweaty when walking my dog at 6am and I am seeing fall flavors snacks everywhere, so I can safely assume that much of the country is probably starting to see some fall weather. Anyways, last week I decided to celebrate the beginning of the fall season by making a super delicious pumpkin almond flaxseed bread. I sliced it up and ate it throughout the week (plus froze a couple slices for later) for an easy breakfast on the go. And it was delish, satisfying, and easy to eat in the car during my morning commute. So it will definitely be a recipe on repeat for awhile. Purchasing breads and muffins for breakfast can seem like a convenient choice, but a lot of them have a lot more added sugar then necessary, and are made with refined wheat, so less fiber and vitamins. 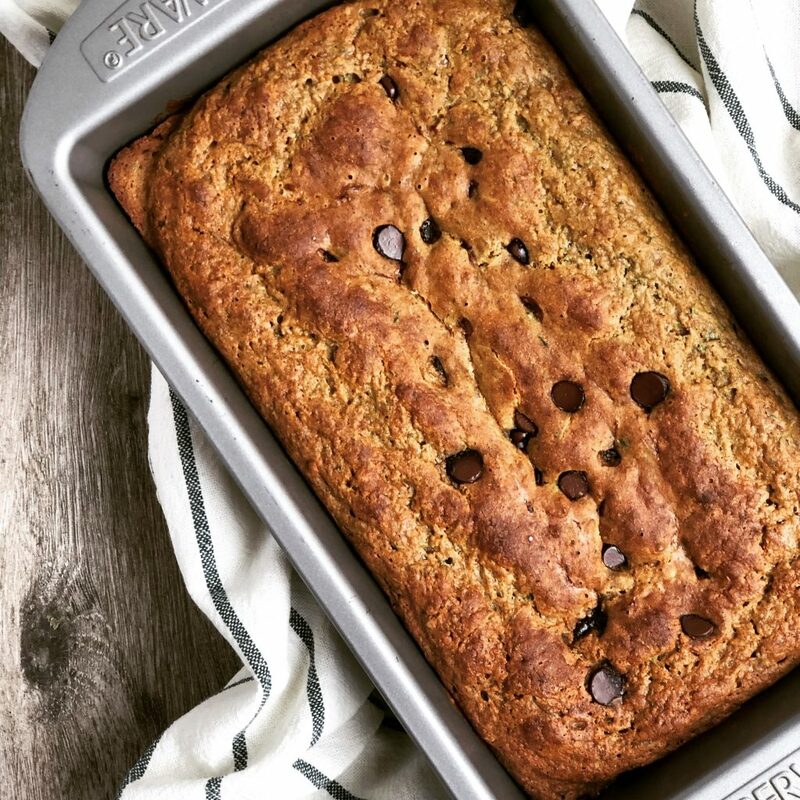 My pumpkin almond flaxseed bread does contain some added sugar, cause delicious is always a requirement for making recipes in my book, and I felt like it does needs a touch of sweetness. But 1/4 cup of maple syrup for the entire loaf really isn’t that much at all. 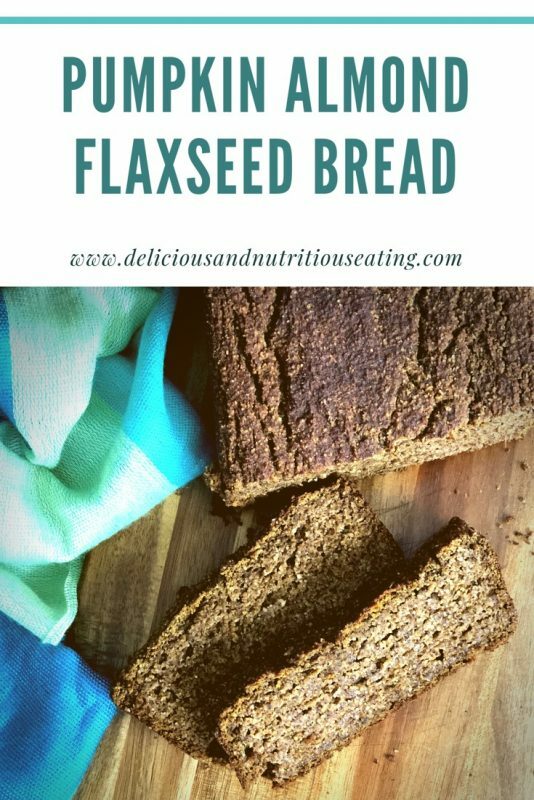 Additionally, I added milled flaxseeds (make sure you buy them ground or milled and not whole) for the extra fiber and omega 3 fatty acids (think heart health), and almond flour for even more healthy fats, fiber, vitamins, and minerals. 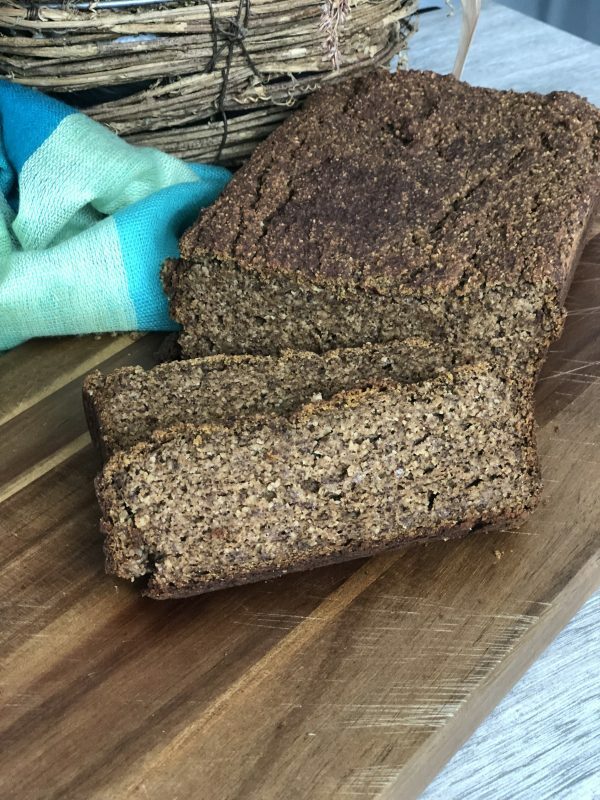 All the protein, fat, and fiber in this pumpkin almond flaxseed bread can definitely help prevent the high blood sugar spikes that you might see from eating a commercially baked bread or muffin with lots of sugar and refined all purpose flour. 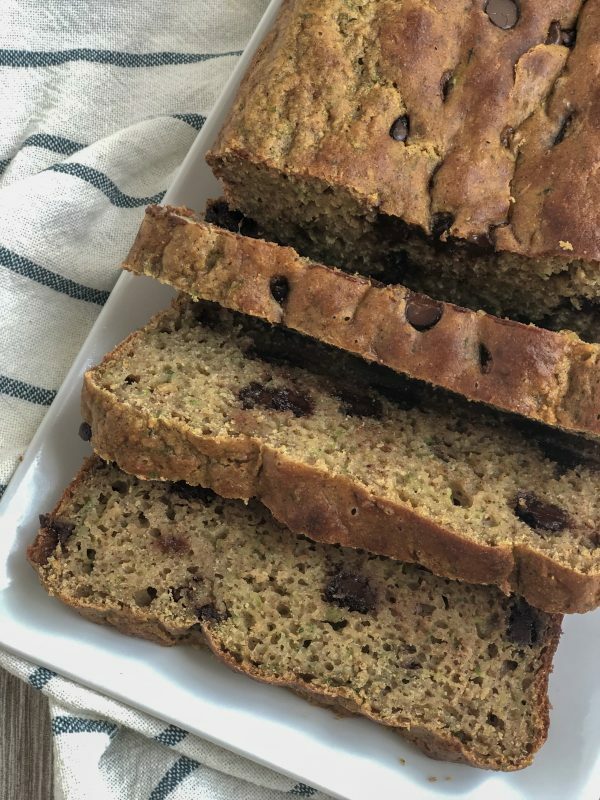 Bottom line: you should definitely try making this bread for both the deliciousness and nutritiousness, you won’t regret it. Happy baking! Need more pumpkin recipes? My Mini Pumpkin Cheesecakes make a super easy and pre-portioned dessert. Or if you are looking for an appetizer, my Skinny Pumpkin Dip can be whipped up in no time.